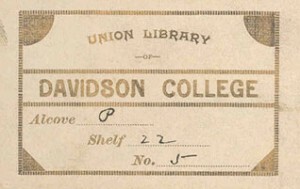 The Davidson College Library has undergone several transitions as it has grown along with the College, and most of those transitions have involved students. In 1860, the first College Library was installed in the newly built Chambers building. The Library began as a small collection of 230 volumes, but Philanthropic and Eumenean Societies also had their own libraries. The libraries remained separate for over twenty years, until Philanthropic and Eumenean Societies decided to merge their libraries with Davidson’s and create the Union Library. On January 20, 1887, students banded together to move books from the society halls and into the library. Freshmen and sophomores were in charge of moving the books from the halls to the Union Library, while juniors and seniors put them on the correct shelves. With only about 10,000 volumes to move and the short distance, this transition took less than a day. With the expanding number of volumes, the Union Library quickly grew too small for all its books. In 1910, most of the books were moved to the newly built Carnegie Library (now the site of the Carnegie Guest House). By the time Dr. Chalmers Davidson became the head of the library in 1936, Davidson College had around 40,000 volumes to its name. In 1941, the much larger Grey Memorial Library was completed (now the site of the Sloan Music Building). 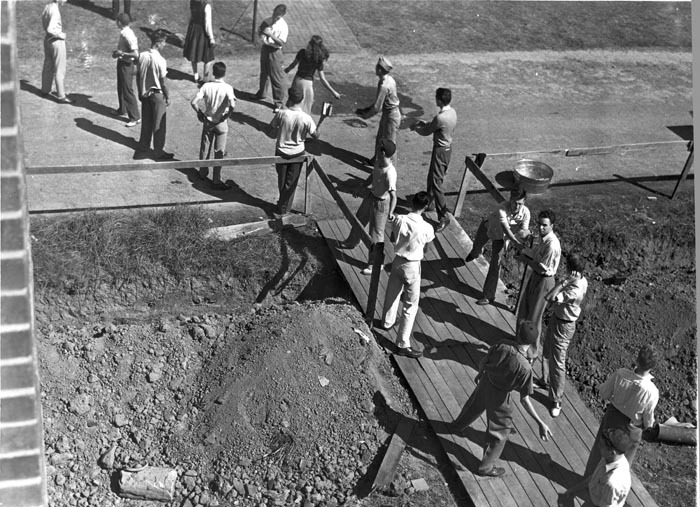 Dr. Davidson writes that it was “a warm October 1, 1941” and “the books from Carnegie Library were moved by a ‘living chain’ of students and faculty…each member took pride in doing his part” to pass the books hand by hand. The day was not about forced labor, as it was declared a holiday free from classes, and music and food was provided for the workers. A ball game was even broadcast over a loudspeaker to keep the chain entertained. This living chain became known as the “Bucket-book Brigade” of Davidson College. The Grey Memorial Library was much bigger than the Carnegie Library, and a new wing was even added to increase the capacity to over 180,000, but Davidson simply acquired too many books. In 1974, the E.H. Little Library was completed, and the students began moving the 200,000-plus volumes across campus. This time, instead of passing the books hand to hand, they organized trucks that brought the books from one library to the next. Moving the books took most of the summer, and the new library was dedicated on September 27, 1974. This entry was written by Sarah Adams, the student assistant to Davidson College Archives. For those interested in the very early history of the college, the Archives website has digital collections of committee minutes and catalogs. (http://www3.davidson.edu/cms/x17527.xml) The committee minutes do have transcripts but you are welcome to try out your skills in reading 19th century handwriting.